If you are a business owner take a stand for genuine religious freedom and declare “Everyone Only.” If you are not a business owner, encourage the stores you shop at to stand with us. As marriage equality and equal rights for the lesbian, gay, bisexual and transgender community sweeps across the nation, countless states have responded with legislation that distorts America’s promise of religious freedom and gives businesses the license to discriminate on the basis of religious doctrine. Those of us who love and cherish both religious community and the First Amendment know that such discrimination has no place in America’s rich tradition of religious freedom. 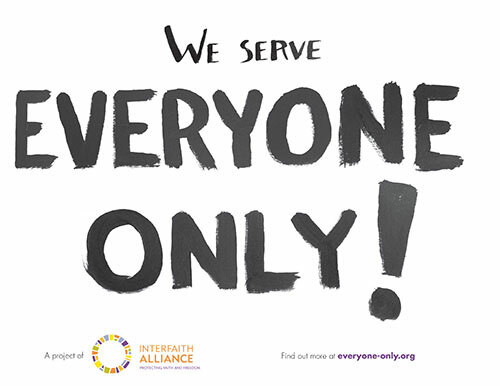 Will you join Interfaith Alliance in our effort to show that people of faith and business owners across the country who know that the pluralism and civility are the true core of religious freedom in America? Download your own sign to display your conviction. Are you business owner? Print this sign out and assure your customers that all our welcome at your establishment. Ask your supervisor to post this at your workplace, or share this sign with the owners of your favorite stores and restaurants. Show that your community is open to all! You can also download a badge to add to your website. Help stop this hateful and misguided legislation from spreading! Write to your state legislators and members of Congress today, tell them that religious freedom should never be used to discriminate!